SNGs tend to be pretty tough to master especially as you move toward the higher buyin levels. Fortunately, Americas Cardroom has come up with a way for you to pad your bankroll as you engage in these fast-paced competitions. With every sit-and-go you register for, you’ll be increasing your rank on the Sit & Crush leaderboard, and at the end of the week, you may receive tourney coupons and cold, hard cash! The top contestants at the end of each Saturday – Friday period will take home prizes of $1,250, $500, $125 and $50. The more sit-n-go fees are paid during the week, the more players will be thus rewarded. Extra funds that don’t fit nicely into the payoff increments will go toward augmenting the top cash finishers in each tier except for those who have earned $1,250. In addition, seats to a satellite tournament are handed out to the best placers each week. The satty is worth $50 + $5, and it awards a minimum of four seats to the $1,000 + $50 The Cage event. The cash payouts and tournament entries are distributed independently, so there will be some people who win one but not the other. In total, around 100 people each week receive compensation of at least $50, and the majority of them also get the Cage satellite tournament ticket. The valuables handed out through Sit & Crush are paid for by taking approximately 25% of the fees from SNGs, Jackpot Poker and On Demand tournaments. Heads-up Sit-n-gos are excluded. The fee structure for these games at Americas Cardroom is very fair; the fees haven’t been raised at all to pay for this promotion. 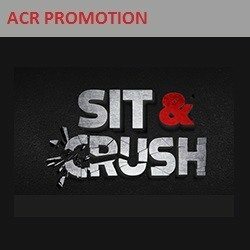 If you want to know how to create your account at ACR to benefit from Sit & Crush and the welcome bonus, consult our Americas Cardroom bonus review page. Want to play? Register at ACR now!